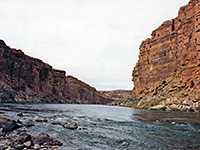 Downstream of Lees Ferry, the first few tributaries of the Colorado River are short and narrow - the side canyons become steadily wider and more branched further south as the main ravine deepens. The first one and therefore the shortest is Cathedral Wash, 4 miles from the Ferry, which has a very pretty section of limestone narrows and although only one mile long, the passageways have a great variety of features and cut through many thin rock layers with interesting, eroded formations including steps, benches, small pools and dryfalls, some of which are up to 10 feet high though all are simple to bypass. The canyon is not the most colorful around as the rocks are predominantly drab and grey so some of its passages are a little gloomy especially on a cloudy day. 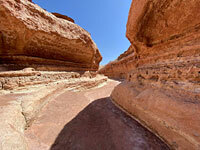 Nevertheless, a trip through is an excellent short, easy and popular hike. Cathedral Wash is a minor drainage that begins at the base of the Vermilion Cliffs, just beneath the Paria Needle formation which sits 2,000 feet higher at the edge of the Paria Plateau. It flows across the colorful, eroded land east of the cliffs, crosses the side road to Lees Ferry 1 mile from its junction with ALT US 89 then meets the Colorado River 1.5 miles beyond. Beside the road and just south of the wash is the distinctive formation of Cathedral Rock after which the creek is named. The wash is not signposted but there is a parking area opposite, the second one from the main road, with an information board about erosion. Most of the canyon and all of the surrounding desert is within the Glen Canyon National Recreation Area though the lowest section near the confluence is part of the Grand Canyon National Park. 9 views of Cathedral Wash.
TopoQuest topographic map of Cathedral Wash.
East of the Lees Ferry road, the wash is soon enclosed by vertical cliffs a few meters high - initially reddish mudstone, then unusual, speckled, potmarked white Kaibab limestone which also doesn't extend too far and is replaced by the horizontal, thin-bedded strata that continue all the way to the Colorado. 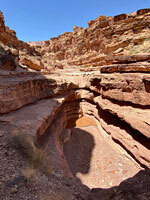 The canyon narrows and deepens quickly, becoming quite dark as the eroded, curving rocks above overhang in some places. 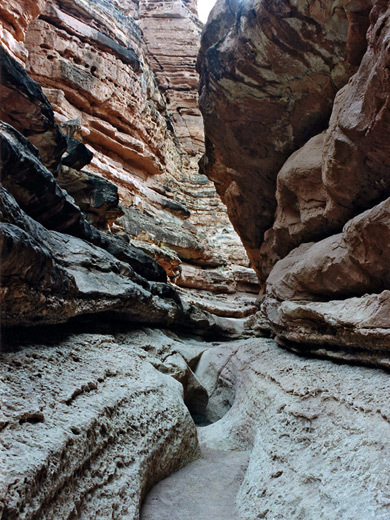 Many smooth flat ledges along each side of the canyon provide alternative ways to descend and pass the few obstructions - occasional dryfalls, and in wet weather, sticky mud patches and pools several feet deep. The route opens out about 10 minutes before the river, where the rock changes to Toroweap sandstone and the last section is filled with large boulders, fallen from the cliffs around the Colorado which at this point are not yet very high or steep. A round trip takes less than an hour.